Heneghan Peng, the Irish architecture studio is on the shortlist for the World Building 2017 Award with their Palestinian Museum. The site of the museum was offered on a long-term lease by the adjacent Birzeit University. As per Dezeen: "Every element of the landscape of Palestine tells a story of intervention, production, culture, environment and commerce," said the architects. "Embedded in its terraces is this rich and very particular history." 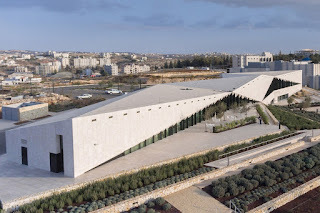 "The approach to the Palestinian Museum design was to draw on this history, placing the museum building into its immediate site, yet drawing from this site to tell a larger story of a highly diverse culture." Covering an area of 3,500 square meters, the museum contains exhibition spaces, an open-air amphitheater, indoor and outdoor cafes, classrooms, offices and storage areas. "The building has a powerful presence, at once defensive and welcoming, robust and permeable, channeling a sense of the region without resorting to the Islamic pastiche of pointed arches and turrets favored by the nearby university campus. A sequence of spaces that somehow evoke the dense urban forms of Palestinian towns squeeze you through narrow passages and tapering stairs, opening out into lofty halls where the angular geometry soars skywards." But as with everything in the region the adventure was not without turmoil: In 2015 the institution's director Jack Persekian resigned and his opening show was cancelled. And of course travel restrictions by the Israelis do not make things any simple. So it is indeed a pseudo-miracle the museum got constructed and is now even shortlisted for such a prestigious award!